Has radiating, shooting sciatic pain in your low back and legs got you down? I mean, literally, on the couch, in pain? You may be tempted to stay down. After all, who wants to get up and get moving when they’re in pain? But I urge you to give movement a chance. First, because not moving can actually worsen sciatic nerve pain, especially if you’re sitting in the wrong position (1). Second, because we want not only to relieve your sciatic pain, but also start on the road to strengthening areas of your body that may help prevent further pain. 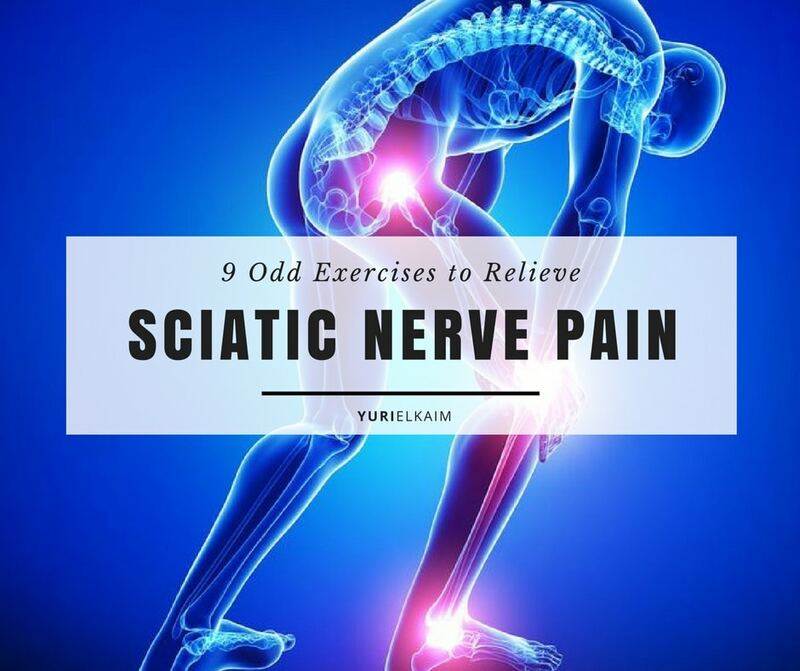 I’m going to outline specific exercises that will show you how to relieve sciatic nerve pain. But before we get into them, let’s spend some time talking about the sciatic nerve and what can cause it to flare with pain. The sciatic nerve is the largest single nerve in the body. It begins in the lower back where it joins with several “branches” of nerves, forming one large nerve that runs all the way down through your buttocks to your feet. Sciatic pain can be caused by the nerve becoming pinched or compressed by discs in the lower back and hips. The cause of the compressed discs could be a variety of factors, from an injury to repeated poor posture. To make things even more complicated, the nerve can be pinched at different (perhaps even multiple) points. As if that weren’t enough, sciatica can also be aggravated by the piriformis muscle, which is located deep in the hip and runs close to the sciatica nerve. When it becomes excessively tight or inflamed, it can irritate the sciatic nerve and cause shooting and/or tingling pain in the low back. 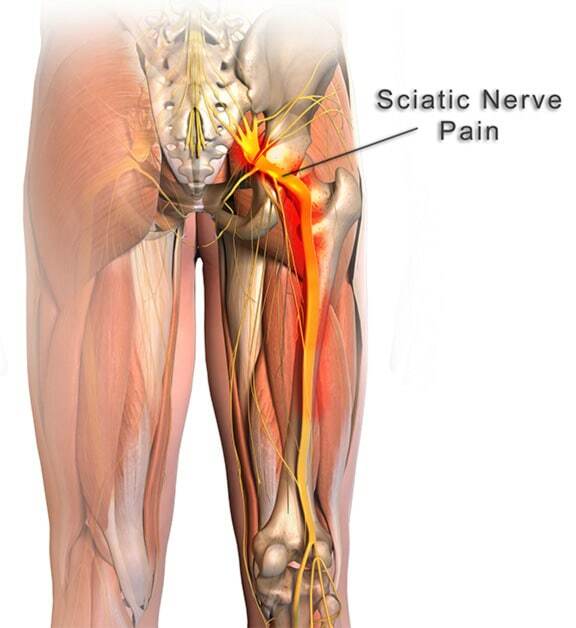 Sciatica pain symptoms can also include: weakness, burning, numbness in the feet, or a pins-and-needles feeling. Some exercises can help relieve this pain. Of course, if your pain is intense and lingering, you’ll want to talk to your doctor or physical therapist before starting any kind of exercise program. With that being said, most of the exercises I have for you below are safe to practice on your own to relieve mild to moderate sciatica. Their main focus is on relieving pressure on the sciatic nerve through stretches that open a tight piriformis and hip flexors, while also strengthening the stabilizer muscles of the low back, core, glutes, and legs to encourage proper alignment of the spine and discs. While these exercises are some of the best you can do to help relieve sciatic pain and prevent future pain, please remember that everyone is different. If an exercise or stretch doesn’t feel right to you, the last thing you want to do is go deeper into it – even if it has worked for someone else. For instance, there are some people that say downward dog pose helps relieve their hip pain and low back pain, while others say not so much. The point is, just because the majority say an exercise helped relieve their pain doesn’t mean it will with yours. Stay aware of your body, do these movements with mindfulness, and if an exercise doesn’t seem to be helping, try another! You’ll notice that most of these exercises are either yoga poses or pilates-based moves. Both of these forms of exercises are great for sciatic pain – especially yoga – due to their ability to relieve pressure on the sciatic nerve through stretching, while simultaneously strengthening the surrounding muscles that hold everything in correct alignment. Tight hamstrings combined with a weak core and back is a recipe for sciatica aggravation. Downward dog stretches the hamstrings and engages the stability muscles of the core and lower back, which can help relieve pressure on the sciatic nerve. Begin on the floor with your knees directly under your hips and your hands slightly ahead of your shoulders. Turn your toes under, spread your fingertips, exhale, and raise your knees off the floor. Lengthen your tailbone to the sky, letting your gaze fall between your arms. Gently work toward touching your heels to the ground. Don’t worry if it takes a while to develop enough hamstring flexibility to do this. Hold this pose for one to three minutes. Spending too much time with your body folded forward while sitting is one of the most common causes of sciatic pain, as it helps pinch the nerve. Cobra pose opens your chest and shoulders while stretching out the front of the hips and hip flexors, relieving pressure between the disks. Begin lying on your stomach with your hands on the floor beneath your shoulders. Keeping your elbows tucked into your sides, lift your head and torso by pushing with your hands. Feel the stretch throughout your abdomen, hip flexors, and quads as you hold for 30-60 seconds. The low lunge is great on its own or as part of a yoga sequence. It opens and stretches the hips and flexors, while also engaging the core stabilizer muscles. Begin in a lunge position, one leg forward with the other extended behind you. Slowly lower your back leg to the floor and reach your arms toward the sky. You should feel a stretch in the front of your extended leg and hip flexor. Hold for 30 seconds, then return to your starting position and switch legs. Begin seated tall on the floor, knees bent out to your sides, with the soles of your feet touching. Pull your feet gently in toward your body until you feel a stretch through your hips and inner thighs. Once your flexibility increases, try to touch the outside of your knees to the floor. Hold for 30 to 60 seconds. The dead bug is fantastic for strengthening the core, which has the ultimate purpose of protecting your spine from unnatural movement. This exercise helps your body return to proper spinal alignment, which could relieve compression of the sciatic nerve. Begin lying on the floor on your back. Engaging your abs, raise your legs off the floor at a 90-degree angle. Now, extend and lower your right leg until its just a few inches off the floor, while simultaneously raising your left arm over your head. Hold for a two-second count. Now, bring your extended leg and arm back to the starting position and repeat on the other side. Bridge exercises are awesome for strengthening the posterior chain – the glutes, hips, low back, and core, which all help keep the spine and nerves in proper alignment. Studies have shown that performing exercises that engage these muscles helps alleviate and prevent back pain and prevent injuries (2). Begin lying face-up on the floor, legs bent at a 90-degree angle to the floor. Engage your glutes and core and push your hips toward the sky. Hold for a beat, then slowly lower until you’re almost touching the floor. Thrust your hips up again. The kneeling arm and leg reach is another great core strengthener, with the bonus of also strengthening the lower back and glutes. This will help you to maintain proper posture and take some of the pressure off the low back to support your spine. Begin on your hands and knees, hands directly under your shoulders and knees directly under your hips. Keep your spine in a neutral position, engaging your core and avoiding letting your back sag toward the floor. Keep your shoulders back and down, with your head in line with your spine. Now, extend your right arm in front of you while simultaneously extending your left leg out behind you. Hold for a breath, then return to starting position. Repeat on the left side, alternating, for 10 to 15 reps.
Cat-cow pose is excellent for improving flexibility of the spine, and encouraging proper alignment due to its gentle core-strengthening effect. Begin on the floor on your hands and knees, with your hands directly under your shoulders and your knees directly under your hips. Inhale, lifting your chin and chest to gaze up at the ceiling while arcing your belly toward the floor. Now exhale, engaging your abs and pulling your belly toward your spine. Round your back fully toward the ceiling. The eye of the needle stretch is perfect for stretching the piriformis muscle that commonly irritates the sciatic nerve. To begin, lie on the floor on your back. Now cross one ankle over the opposite thigh – you should already feel a stretch throughout your outer hip. You may want to stay with just the ankle crossed, but if you’re looking for a deeper stretch, go ahead and lift your bottom leg off the ground slightly, wrapping your arms around the hamstring for support. Be sure to keep your head on the floor and shoulders relaxed. Hold this pose for 30 to 60 seconds, then switch legs. While these exercises will go a long way in helping to relieve sciatica, there are a few other things you might be doing that could continue to make your pain worse. All of these activities put even more pressure on the sciatica nerve, which is of course going to be counterproductive to performing pain-relieving stretches and exercises. No one should have to live in pain (and even worse, on pain medication) their entire lives. Even though sciatic nerve pain is a reality for an overwhelming amount of people, taking a proactive stance by exercising might not only relieve pain, but help prevent it from worsening in the future. Feeling tired, sore, and generally beat up? Click the banner below to get the Workout Recovery Formula and start feeling better now!